Be the first to share your favorite memory, photo or story of Albina. This memorial page is dedicated for family, friends and future generations to celebrate the life of their loved one. 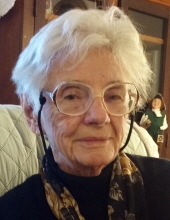 Albina Aspell, 92, of Peoria, former editor and publisher of The Catholic Post and a national figure in the Catholic press, died on Thursday, April 11, 2019, at Apostolic Christian Skylines in Peoria. Born April 9, 1927, in Cleveland, Ohio, to Ignatius and Anna (Cesar) Molek, Albina joined the staff of The Cleveland News upon graduating from John Adams High School. During nearly a decade as a writer for The Cleveland News, she continued her education in journalism at John Carroll University in University Heights, Ohio. She later served as a correspondent for Fairchild Publications, publishers of Women’s Wear Daily. She married William Aspell in Cleveland on Nov. 8, 1952. After moving to Peoria, they co-founded The Penny Press, a weekly publication, in 1971. Mr. Aspell died in 1976. In 1974, Albina joined the staff of The Catholic Post, the newspaper of the Diocese of Peoria. During her 21 years with the publication, she became its first lay editor in 1982 and its first lay publisher 10 years later. She also briefly served as communications director for the Diocese of Peoria. Considered a pioneer for women in the Catholic press, she was elected president of the Catholic Press Association of the United States and Canada in 1986. In that capacity, she addressed Pope John Paul II and the World Synod of Catholic Bishops at the Vatican on Oct. 7, 1987, promoting the benefits of a “free flow of information” on church matters. Albina received the St. Francis de Sales Award, the highest honor bestowed by the Catholic Press Association, in 1992 for her “distinctive and eloquent leadership in the Catholic press and for her role as a dynamic force and inspiration.” She retired in 1995, and most recently resided at Independence Village in Peoria. She was a history enthusiast and especially interested in Abraham Lincoln. An avid reader, she was the founder of Guildhall Publishers. The Peoria-based book company published several editions of “The New Question Box,” compilations of nationally syndicated question-and-answer columns by Father John J. Dietzen. The 1991 edition won first place among popular presentations of the Catholic faith in the annual competition sponsored by the Catholic Press Association. She is survived by a son, William (Samneang) Aspell, of Granite Bay, California; a daughter, Ann Aspell (Leigh Seddon), of Montpelier, Vermont; a daughter-in-law, Roxanne Aspell, of Peoria; and four grandchildren, Emily Seddon, Anna Seddon, Conor Aspell, and Colin Aspell. In addition to her husband and parents, she was preceded in death by a son, Daniel, and a sister, Anne Ranik. A funeral Mass will be celebrated at 10:30 a.m. on Monday, April 15, at St. Vincent de Paul Church in Peoria. Visitation begins at the church at 9:30 a.m. Fr. Thomas Taylor will officiate and burial will follow at Resurrection Cemetery in Peoria. In lieu of flowers, memorials may be made to a favorite charity or to the Franciscan Monastery of the Holy Land in America in Washington, D.C.
To send flowers or a remembrance gift to the family of Albina Aspell, please visit our Tribute Store. "Email Address" would like to share the life celebration of Albina Aspell. Click on the "link" to go to share a favorite memory or leave a condolence message for the family.